In this Trust.Zone review, I’ll go through all of the pros and cons I ran into when trying out their software on my Macbook. 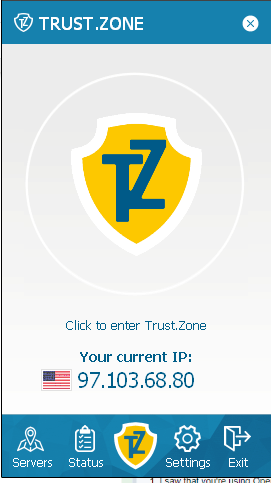 Trust.Zone is a virtual private network created in 2014 by a company called Trusted Solutions, LLC. They are based out of Seychelles, a country with no data retention laws. What you need to know is that, as of 2019, this VPN service has a standalone app for Windows only. On the company’s official logo, they refer to their app as “The One You Can Count On.” They claim to help you stop your ISP from tracking you and to protect your privacy. And in this Trust.Zone review, we’ll force them to put their money where their mouth is. Can you count on them? Do they keep your anonymous, hide your IP and keep you secure on a public Wi-Fi? Let’s all take a look to find out. There are A LOT of Pros listed under here. That’s a good sign. First off, they mask your IP, tunneling your connection to one of 157 servers located in 84 regions across the world. They’re using state of the art OpenVPN protocols with AES-256 encryption, so your activity is locked up tight. They’re not logging your information, so, YAY. What’s more, you can torrent to your heart’s content and watch Netflix. They’re also located outside the jurisdiction of the huge information gathering alliances that threaten the security of many VPNs. Trust.Zone is based out of the Seychelles islands, specifically in Mahe. Aside from being a tropical paradise worthy of beverages served out of coconuts, Seychelles falls outside the jurisdiction of the three major surveillance alliances. These nations pool their espionage efforts, so if your VPN provider is located in any of them and they “request” to see your information, you’re screwed. Using a VPN from any of these countries is always a risk. They can demand your data at any moment. And then share it with half the globe. But the core tenant of anonymous web browsing is anonymity. If you’re using a VPN, it’s because you want added security and for your activity to be private. Despite this, many VPNs keep a log of your personal information, including the very activity you’re trying to hide. Most VPNs will claim that they don’t log. Trust.Zone makes a similar statement. We’ve been burned by this before, though. So we always do a little detective work. Privacy policies will always help you uncover the truth, and every VPN has one. Looking through Trust.Zone’s policy showed some promising information. They’re not taking any of my personal info. They’re not saving my name, where I live, or my phone number. They just want an email address which is only used for communication about their services. As far as information gathering policies go, this is good. Between this and their presence outside of surveillance alliance jurisdiction, your anonymity is assured. When choosing a VPN, you want to make sure that they’re using state-of-the-art technology to hide your activity. This is your personal information on the line, so you want to know that the VPN you choose is utilizing top of the line encryption and industry standard protocols to tunnel your signal. With Trust.Zone, you have all of that. They offer you a choice between two tunneling protocols, the first being OpenVPN. And it has been proven time and again to be the best of the best. The technology behind OpenVPN is open sourced, meaning that the security community is constantly maintaining and upgrading its systems. That’s why it’s the preferred protocol being used by most of the top VPNs in the world. Trust.Zone’s OpenVPN is paired with AES-256 encryption. This is more great news as it has been proven uncrackable by modern technology. This is some real deal, government-level, Area 51 kind of encryption. The other protocol Trust.Zone uses is L2TP, which stands for Layer 2 Tunneling Protocol. While it’s nice to offer another protocol, L2TP is far from secure and should be avoided if possible. IP leaks threaten to undermine a VPN’s entire purpose. These critical errors can expose your hidden (real) IP, stripping you of the very anonymity you were originally seeking. The two most common are DNS leaks and WebRTC leaks. A DNS leak happens when an error within a DNS server causes the VPN tunnel to be completely bypassed, revealing exactly where you’re sitting. 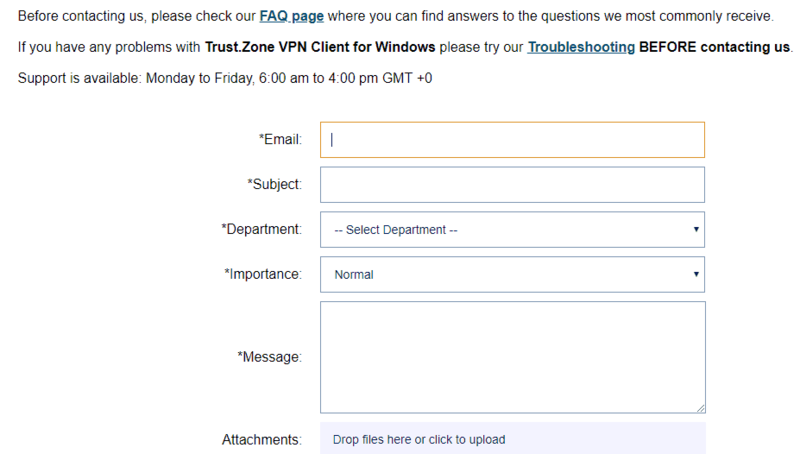 Trust.Zone addresses WebRTC links on their Frequently Asked Questions page. The API’s used by WebRTC tech can play havoc with a VPN. While WebRTC is beneficial to the browsers that it serves, it’s one of the greatest threats to anonymous web activity. Because of the danger posed by IP leaks, we put every VPN that we review through a series of six tests to make sure that leaks aren’t plaguing the system. Touch.Zone passed with flying colors. Out of the six tests that we ran, it passed every single one. We’re happy to give Trust.Zone a clean bill of health and declare it leak free. We also ran a thorough virus test on this VPN, checking for 66 different known viruses. These invasive issues can gather information on you, shooting it back to cybercriminals. Of the 66 viruses we tested for, Trust.Zone came back negative for every single one. Speed is always an issue with VPNs. The tunneling process saps away some performance, but when you’re using a quality service, the loss is barely noticable. This is something that Trust.Zone is very upfront about on their website. We checked out two of Trust.Zone’s servers – one in the EU and one in the US. We recorded the loss of speed for both, and were pleased with what we saw. The EU server was faster, with speeds only falling off by a small margin. While the US Speed test lost a bit more, it was still well within the acceptable range. Out of the 78 VPNs that we’ve reviewed, we rank Trust.Zone at #15 in terms of speed. It’s rare to find a VPN that works with Netflix. Because Netflix hates VPNs, and has gone out of its way to deploy one of the most effective VPN blockers in the world. This keeps users from bypassing geo-blocks and accessing content from other countries. So, chances are if you were trying to run Netflix from any old VPN, the end result was a screen looking something like this. Netflix’s black screen of doom is the telltale sign that you’re using a VPN that fell victim to their ban. We checked five of Trust.Zone’s servers and two of them allowed us to play Netflix content with no issues. That means Trust.Zone is a member of an exclusive club – VPNs that work with Netflix. Torrenting is a popular method of peer-to-peer (P2P) file sharing, in which users download tiny bits of a file from other users. This makes the download process breeze by, but it also opens your system to new threats. Some of those peers you’re connecting with might have sinister intentions. Hackers often use torrenting services to gain access to people’s personal information, so having a VPN as an added layer of security helps to protect your data. Still, though, many VPNs either limit access to P2P on their servers, or ban it outright. But Trust.Zone allows you to torrent on any of their servers with no restrictions. In fact, they made it onto our list of the Top 10 VPNs for torrenting. A strong server park grants VPN users the gift of flexibility. More servers mean more choices and more opportunities for seamless anonymous browsing. 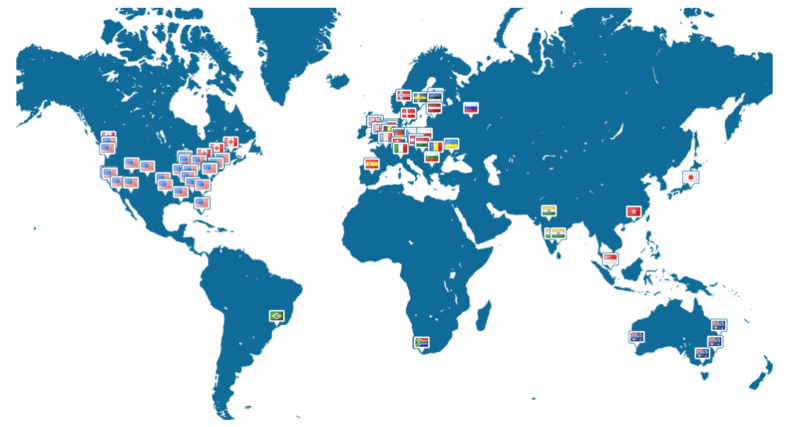 Trust.Zone has 157 servers spread out over 84 locations. Trust.Zone allows three connections at a time, per account. This gives you the option of having both your phone and computer connected simultaneously and lets you share your account with close friends or family members. Unlimited bandwidth ensures that no throttling is going to occur, so browse to your heart’s content. 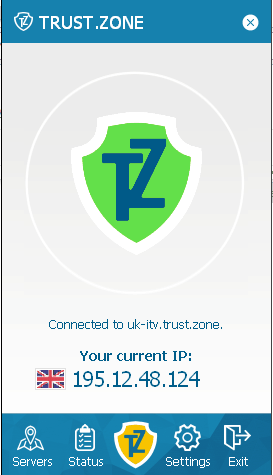 Because Trust.Zone does not restrict your internet traffic, that means it is also compatible with the Tor network. Tor is a browsing interface which hides your activity. It’s a free and imperfect system that falls under some scrutiny. For example, while a government agency cannot see what you’re doing on Tor, it can see that you’re using it, which can arouse suspicion. Coupling Tor with a VPN adds additional security, blocking this fairly fatal flaw. I was also happy to see that Trust.Zone includes a built-in kill-switch to protect your anonymity. 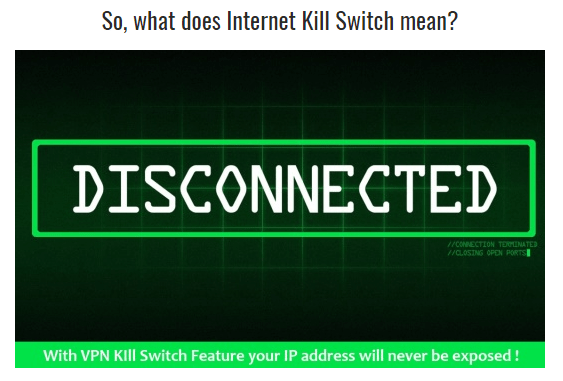 A kill switch is a VPNs last line of defense. If something happens that threatens the security of your session, it cuts the service off before you get discovered. Think of it like an escape pod. If your signal comes under fire it allows you to jettison out and live to browse another day. The installation and use of this program was a breeze. I clicked the download link on their official website and installation was underway and completed within three minutes. Once everything was installed, I just had to click on the yellow shield to connect. Connection took less than 20 seconds. Once the shield turned green I was off to the races. Switching Servers was also very easy. You can switch at anytime just by clicking the server icon on the bottom left. My browsing experience was efficient and fast. All in all, this was a seamless process from installation all the way through use. Wow, this has been a fairly stellar review so far. But there is no such thing as a perfect VPN. There are definitely some drawbacks to Trust.Zone, but the question becomes are they enough to overpower all those pros? A lack of 24/7 customer service, and limited official device support make up the dark side of the Trust.Zone experience. The best VPNs in the world are usable on a multitude of platforms, ranging from computers to phones, tablets, streaming devices, and gaming systems. While Trust.Zone has some great device variety in the desktop and mobile sectors, there’s not a lot going on for smart device users. We’ve got iOS, Android, Linux, Windows, and Mac. 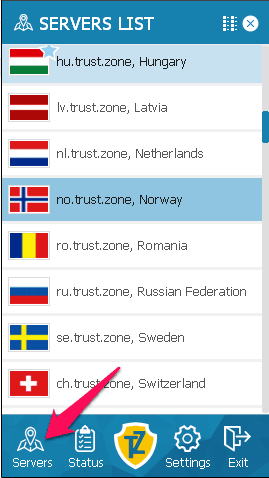 Those are the only supported devices listed on Trust.Zone’s official website. While there’s no official support listed for gaming systems, you can use Trust.Zone in conjunction with some routers, which would protect activity on those devices. A representative of Trust.Zone also told me that there are ways to install the service on Fire Stick or FireTV, but I could not find instructions on their website. Quality customer support is important for any tech product, and even more so with a VPN. When their service is directly responsible for something as important as internet security and anonymity, you want to know that you can reach out for help on any day and at any time. Trust.Zone, however, does not offer 24/7 customer support. You can only receive help through a contact form on their website, Monday through Friday between the hours of 6am and 4pm GMT. I filled out the form, asking questions as to their encryption level and whether they supported Fire TV and gaming systems. I received a response via email the next morning, which contained a link to the ticket I had opened, and their response. Mike from customer service answered my questions, but I wish he had given me a little more information. He says that they have instructions on how to install Trust.Zone on a FireTV, but he provided no link. When it comes to customer service, I’m a stickler for going that extra mile. This limited support window is borderline unacceptable. If I have an issue with the VPN at 4:05 p.m. GMT on a Friday I have to wait three days for any help? Trust.Zone has only one premium plan that is all-inclusive of its features. They offer three tiers, with memberships for month-to-month, one year, or two years. There is a free three-day testing option, which is always nice to see. The test is somewhat limited in terms of servers (offering 108 rather than the full 157) and they cap data transfers at 1 GB. The free trial also allows for only one connection at a time. 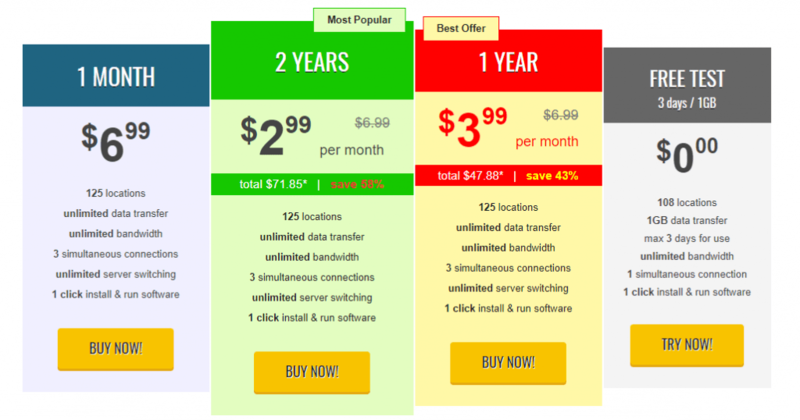 The most expensive option for Trust.Zone is their month-to-month subscription, which costs $6.99 per month. Buying for a whole year saves you 43%, and two years saves 58%. When you buy for two years you’re paying $2.99 per month, which is a great price. There are two extra features you can add on. For payments, there are a bunch of options, which is always great to see. They’re allowing credit cards, PayPro, PayPal, and BitCoin. 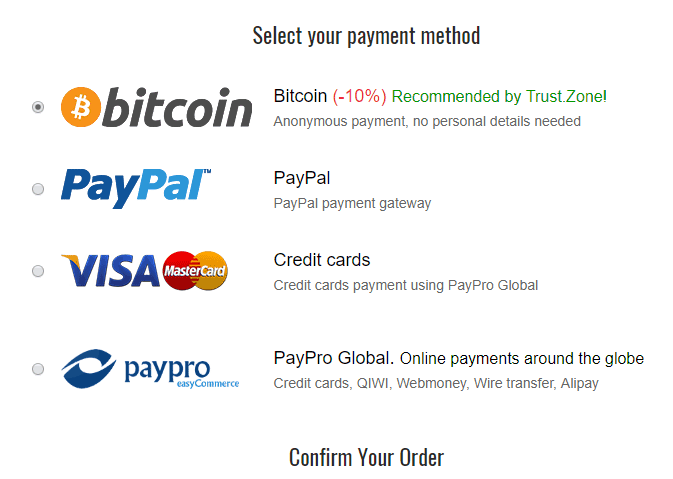 Not only are the accepting BitCoin, but they incentivize it by offering a 10% discount if you use it for your purchase. Besides the fact that Trust.Zone offers the three-day free trial, they also have a 10 day money-back guarantee. You must notify them via email within 10 days of signing up to qualify for a refund. Your bandwidth usage must not be more than 1GB to qualify for 100% refund. It can take up to 20 days to be refunded after requesting a refund. If you paid using Bitcoin, your refund will be processed using the Bitcoin exchange rate for the date they issue the refund — not the date you paid or the date you requested the refund. This is a great VPN service. Installation and use were a snap, and there was no lag at all. The speed loss is more than acceptable, and their encryption protocols are iron clad. I feel safe knowing that my anonymity is assured by their lack of logging and existence outside of surveillance alliance jurisdiction. This cannot be overstated. Our tests proved that their VPN software was completely leak free, rounding out the security trifecta. I also love that Trust.Zone does not presume to tell you what you can and can’t do with your internet time. You want to torrent? Great. Use Tor? Awesome. Stream cat videos on YouTube? Works. And as a VPN which works in conjunction with Netflix, it stands in the upper echelon. I've used TZ for more than just a test period. They were my first choice, and have been acceptable enough to keep using. The service is cheap, fast, and usually reliable. But now I am going to switch, for reasons that are sadly not mentioned in this review. First, you need to try more tests before declaring it leak-free. The Windows client does, in fact, leak DNS requests. This is obscured by the software which automatically changes your ISP network connection settings to use their proprietary DNS servers, *masking* any leaks. I've tested and can confirm that DNS requests go out from both the VPN-created network connection AND the ISP-facing connection. That's worse than simple DNS leaks because it covers up the fact that DNS requests are being routed outside the VPN tunnel. DNS leak tests need to check which network adapter the requests are going through, not just which DNS server they go to. There is ZERO information as to who runs this service. No hiring posts or employees anywhere on earth. "Extra Solutions", or "Trusted Solutions" (the name they began using later) also have no records anywhere. This service is a black box. Could be run by Russia, could be the NSA, could be a hacker collective which will eventually use all the information they can gather. There is no way anyone can trust their no-logging policy since there's no evidence this is run by a real business. To be honest, it's disturbing how nearly all reviewers overlook this elephant. Claiming to be located in Seychelles is far from a guarantee your data is out of spy agencies' hands. Until March of 2018 I had excellent connectivity, speed, server availability, and could access Netflix well. Since then, one by one the servers setup for accessing Netflix usually with the naming scheme country-nfx.trust.zone (ex: uk-nfx.trust.zone) were blocked by Netflix. Now those servers have been removed from the list and no notice or blog post or email, nothing from Trust.Zone about this. I had to submit multiple support tickets to finally get them to confirm that their VPN servers could no longer connect to Netflix. Add Trust.Zone to your list Providers that are blocked. 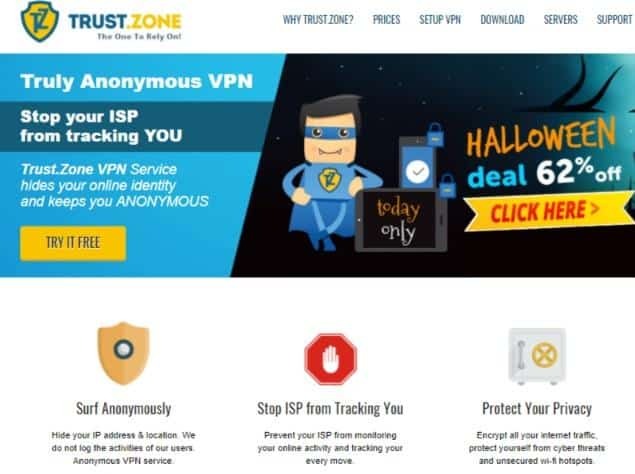 While I can’t say I’ve tried a lot of VPN providers personally, I’ve set up VPNs independently and did some research before going with TRUSTZONE . I’ve been very happy with their service, as well as the win app. which make it easier and quicker. Great speed up to 100 mb/s. Lots of location options. Of course, there are still a few things I’d like to see to make the service even better, but of the available options I’m aware of, I believe them to be about the best around. I’m now on my 2nd year. I have tried several vpn services, but this is the best. If you think your protected with other services, check the DNS leak protection or WebRTC leak protections. 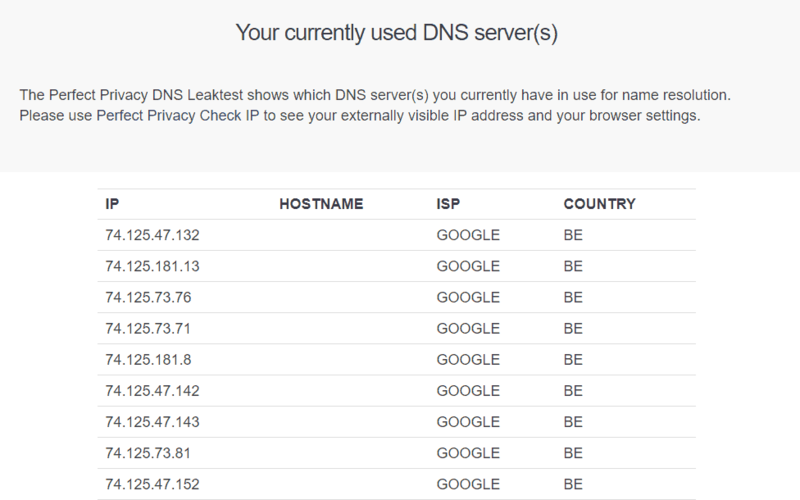 You may be surprised your leaking DNS information, which leaves you exposed. However, your covered with Trustzone. This is critical in remaining anonymous. I use this to access Netflix in other countries to see what is different. I’ve tried it to watch BBC and found it acceptable. Works great. Sometime I have to try other servers in different regions to find acceptable bandwidth but overall It works as advertised. They keep developing improvements and regularly update their software.